SIR JOHN RAWDON (1720-93), 4th Baronet, 1st Baron Rawdon and 1st Earl of Moira, established the Montalto estate. The market town of Ballynahinch in County Down, like Moira, was laid out by the Rawdon family in the first half of the 17th century. The Montalto Estate is located on the edge of Ballynahinch. MONTALTO HOUSE, described by Sir Charles Brett as "a mansion of the utmost interest and with features of considerable importance..." was constructed around the mid-1750s, when Lord Moira moved there and made it his home. The name Montalto derives from the Italian for High Mountain and in the original construction, Italian plasterers were employed, and from the grounds the Mourne Mountains can clearly be seen. The house has had a history of alterations and extensions and it was during the 19th Century that a ballroom and service wing were added by the grandson of the original owner. The ballroom, servants' and kitchen wing were all demolished in 1952. In the mid-1980s the house was damaged by fire. The damage caused - contained in the east wing and the rear apartments - was so severe that this part of the house had to be demolished. The present owners appointed Hobart & Heron to restore the house as a private residence. Major works were undertaken and this included the rebuilding of the east wing. The house is now fully reinstated to its former Italianate glory with all details of both internal and external adornment. Original plastered ceilings, the work of Robert West of Dublin, carried out in 1758, still remain to this day and have also been restored. Of the original two-storey house, only the small sitting-room (called the Lady's sitting-room) remains largely unaltered; while the imposing long gallery could once have been the original entrance hall. The sitting-room ceiling contains plasterwork of exceptional quality. Amidst the fiddle-shaped arabesques there are birds modelled in high relief, a squirrel and bunches of grapes. At one end of the room is a triple niche, the side arches framing plaster scallop-shells, the central one containing a curious stucco relief of a fox driving a cockerel harnessed into an oval curricle. The 2nd Earl of Moira, afterwards 1st Marquess of Hastings, who distinguished himself as a soldier in the American War of Independence and was subsequently Governor-General of India, sold Montalto in 1802 to David Ker. Ker enlarged the house by undertaking what must have been an exceedingly difficult operation: he excavated the rock under the two-storey house and round the foundations, thus forming a new, lower ground floor, the structure supported by many arches and pillars. Consequently, the new ground floor was much higher than any basement would be and the operation made the mansion fully three-storey. Close to the front of the mansion, and overlooking the ornamental lake, there is a substantial mound said to have been built with the spoil from the excavation of the under-storey of the house, which contains a peculiar grotto or bath-house. The entrance front is of two bays on either side of a three-sided bow; the front also having end-bows. There is a shallow Doric porch at the foot of the central bow, the original portico having been removed during the Irish famine because neighbouring paupers caused inconvenience to the Ker family by taking shelter under it. The right-hand side of the house is of ten bays, plus the end bow of the front. The original ground floor is now the piano nobile. In the ground floor of 1837 there is an imposing entrance hall with eight paired Doric columns, flanked by a library and dining-room. A double staircase leads up to the piano nobile, where there is a long gallery running the entire width of the house, which could have been the original entrance hall. 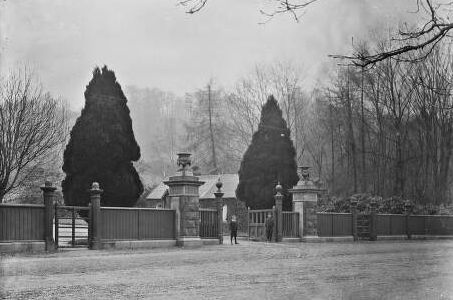 Montalto was bought ca 1912 by the 5th Earl of Clanwilliam, whose bride refused to live at Gill Hall, the family seat a few miles to the west, on account of a regrettable infestation of ghosts. The demesne is largely walled with 17th century origins. It extends to roughly 470 acres today though in 1872 the estate comprised 20,544 acres. As Lord Moira was a noted botanist, planter and improver, it is likely that Montalto once boasted many exotic specimens dating from his time. In 1770, he expended £30,000 (£4.08 million in 2010) in planting over 100,000 timber trees between that date and his death in 1793. There are good stands of mature trees on the undulating site. The Battle of Ballynahinch in 1798 was fought within the demesne, which suffered damage in the conflict. It is said that many thousands of forest trees were uprooted or broken in the ‘Big Wind’ of 1839. There is no walled garden at Montalto, but there was a productive area enclosed by a beech hedge and an orchard. Some of this still survives. There is a lake with an artificial shape of a fish, which can be glimpsed across the lawns from the house. A 1960s eye-catcher gate and clumps of flowering shrubs lie beyond. An arboretum was added to the south-west of the house, beyond a hillock which contains the spoil from the basement of the house when it was dug out. The arboretum is small but has a good representation of exotic trees from all over the temperate world. There was a summer house in this area. The ‘Ladies Garden’ is on the north-east of the house. Since the property had been acquired by Lord Clanwilliam in 1912, it became somewhat neglected in the second half of the 20th century. It was sold in 1979 and became part of a business partnership which replanted the demesne in 1986-89. The house has been in private hands since 1995. Other listed buildings on the property include the 1830s schoolhouse; the 1840s farm complex; the Spa Gate Lodge ca 1825, possibly Morrison; West Gate Lodge, pre-1834; and the Ballynahinch Gate Screen, 1870. The Town Lodge is demolished and several grand designs exist for un-executed gate lodges and screens. The mansion has been available as accommodation since March, 2010. It has eight double bedrooms, a chef and concierge. In about 1840 one in every twenty acres in County Down belonged to the Ker family of Portavo and they owned a further 6,000 acres in County Antrim. They were amongst Ireland's thirty wealthiest families. David Stewart Ker continued from 1844 as an ideal and successful landlord, but the burning down of Portavo House in the same year led to his removal to his Montalto estate at Ballynahinch. However, expenditure on relief work and the loss of rents during the Famine meant borrowing and sales of the library and Old Master paintings. David was returned as one of the Conservative MPs for Down in the violent election of 1852, but at great financial cost to himself. As a Liberal, he lost the 1857 election to the Conservative candidates. His estate debts then exceeded a quarter of a million pounds, and his personal extravagance quickly disposed of the annual balance of about £6,500 available to him out of an estimated income of £31,600, once all outgoings had been paid. He began selling off land in the Landed Estates Court in 1863. By 1867 the estate debts had risen to £371,000 and David had taken to drink. To add to his woes, his second wife and his 23-year old second son, Charley, ran off together in 1871 (Charlie committed suicide five years later). 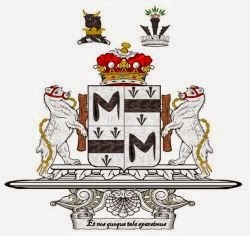 In 1872, he was declared bankrupt, and management of the estates was placed in the hands of trustees, while he himself was pensioned off and his eldest son succeeded to the heavily encumbered estates. Downpatrick had to be sold off in 1873 to one of the trustees, John Mulholland. In 1886, the current Ker incumbent of Montalto, the incorrigibly spendthrift Richard, ardent huntsman and womaniser, was receiving only £910 out of a gross income of £17,490. In spite of the supreme efforts of his trustees and of his solicitor, William Wallace, he too ended up in the bankruptcy courts in 1898 at the age of forty-seven. The agricultural part of the entire Ker estate was sold off in 1911 under the Wyndham Land Act and Montalto itself went to the Earl of Clanwilliam in 1912. The house in the demesne at Portavo was to be the final Ulster home of the Kers. However, by the 1970s the rejuvenated trust fund had been exhausted, and the overdraft had again risen to £80,000. Home farm, demesne, house and its furnishings were sold off in 1980, and the resident Ker moved to Wiltshire, only to lose everything as a Lloyd's 'name' in 1992. First published in June, 2010. Hastings arms courtesy of European Heraldry. I have a Baedeker's of Northern Italy from maybe 1900 signed by a Muriel Clanwilliam. Even now it's relevant.